Sometimes it feels like there’s too much wrong in the world. Melting ice caps, civil war in Syria, enormous refugee camps in Somalia, the creeping growth of the Taliban in Pakistan, gay rights in Uganda, access to abortion in the US, the global decline of the Honeybee, removal of benefits from disabled people in the UK - the list goes on and on and on (and on and on). When the Dragon Swallowed the Sun adds another headache to an ever-growing list: the Chinese annexation of Tibet. Here’s the situation: prior to 1949 Tibet was essentially a feudal state under the control of aristocrats and religious leaders. The vast majority of Tibetans were serfs, bound under hereditary control of whatever noble they happened to be born under. This sort of thing doesn’t really sit well with Communism. So China invaded, seizing Tibet and incorporating it into the Chinese state. The Chinese abolished the ancient systems of serfdom and slavery and cut social ties to the monasteries; for example introducing secular schools. Now on the surface those things sound like positive developments, but it turns out when you invade a country and start systematically rubbing out its thousand year culture people get angry. There were skirmishes, crackdowns and torture. Tens of thousands of Tibetan refugees left the country and settled all around the world. With the Tibetan Parliament-in-Exile and the Dalai Lama on their side Tibetans have been running the ‘Free Tibet’ campaign with the primary aim of seizing control of their native land. The passion in these interviews is palpable; and though the Tibetan campaigners speak calmly and precisely there’s an intensity underneath their words. The older interviewees who lived through the Chinese invasion and subsequent crackdowns on culture, religion and politics are the most emotional, breaking down in tears as they describe their friends committing suicide when the Chinese took over, their futile battles with the gargantuan People’s Liberation Army and the ways they were tortured for their views. These first-hand memories are getting rarer and rarer by the day - this invasion happened 60 years ago and those that lived through it are pretty elderly looking. These vocal supporters of independence have been forced into a self-imposed exile, many of them following the Dalai Lama into India. By the present day, these Tibetans have settled quite comfortably into the fabric of the societies they settled in. 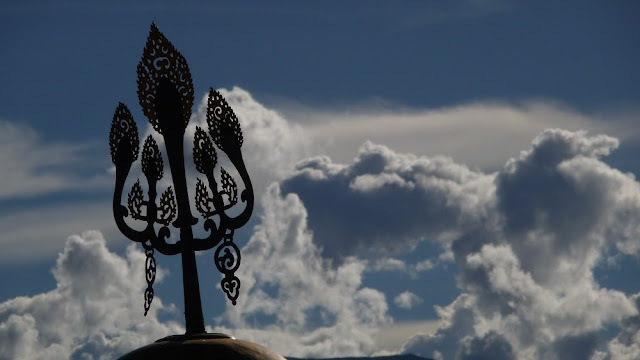 Second and third generations of Tibetans are “dug in”, having social and professional connections in their new countries and never having even set foot in Tibet. The problem here is that though these 2nd and 3rd generation Tibetans still feel a profound connection to their homeland, the question of fighting for independence becomes more academic than practical. They go and shout slogans at attend anti-Chinese demonstrations, but then go back to their normal lives, Tibetan national freedom being an abstract and alien concept, a bit of a pipe dream..
Further down the scale are Western pro-Tibet campaigners, who understandably get quite short shrift in this film. In one sequence we see a protesters for and against the Beijing Olympics angrily clashing with each other. The Chinese quite reasonably ask the Western protesters if they’ve ever been to China or Tibet. The protesters response is generally being a mumbled “No, but I’m planning to go sometime”, which the Chinese treat with the appropriate level of derision. 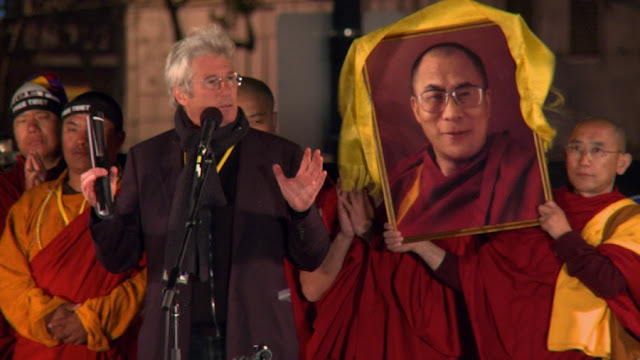 Most embarrassing is a short speech by Richard Gere who boneheaded says that he imagines the Chinese leaders waking up one day, looking at each other and magically realising that they’ve been wrong all these years. When the Dragon... is a handsomely produced film. The landscape of Tibet, India and Nepal makes for beautiful photography, and sequences like an alternative Tibetan Olympic Games are very well shot, as is the chaotic violence and anger of the protests. The soundtrack is similarly impressive, featuring original music from Philip Glass and Thom Yorke (though there’s also a dire Damien Rice song plonked in the middle). These sky-high production standards, coupled with a narrative featuring a peaceful, dispossessed and victimised people versus a voracious and cruel colonial titan should inspire genuine passion in me. It feels like director Dirk Simon is trying to get me to take to the streets, to adore the Dalai Lama and do everything in my power to ensure that Tibet is free, and free now! But it doesn’t. The most emotion the documentary inspired in me was a vague, regretful nihilism. For all the intelligent arguments, tears and political theory expressed on Tibet’s behalf, the situation appears utterly intractable. Simply, the Chinese, with their enormous military and political clout have won every battle since they invaded. Every day since 1950 the question of Tibetan independence has been transforming from an achievable goal into an theoretical one. Much time in the film is given to the Dalai Lama’s ‘Middle Way Approach’, which explicitly doesn’t seek independence: a moderate position that tries to meet the Chinese halfway, acknowledging their possession of the land while trying to ensure that Tibetan national identity and culture is preserved. It’s a nobly pragmatic position, yet it’s difficult to imagine it inspiring much fervour. Slightly more hazy is what a modern Tibetan independent state would even look like. In fact, for a documentary ultimately concerned with politics, the political beliefs of the Free Tibet campaign are curiously absent. Would they revert to the feudal system of land-owners and peasants? Replace authoritarian Communist governance with a dictatorial, theocratic government? Then there’s the question of the hundreds of thousands of integrated Chinese Tibetans - natives who’ve adapted to life under the Chinese and Chinese Han immigrants who have settled in China. Would victimised turn victimiser? And that doesn't feel good enough.